My three children asked Santa for a play kitchen for two years in a row. My husband finally helped my son build a small play stove for their play room and it has hands down been their favorite toy for the past year. Not one day goes by that they don’t cook in their pretend kitchens, sometimes for over an hour at a time. At first my husband was skeptical of “his boys” playing in a kitchen and cooking alongside their sister but to my surprise one day I returned home to find my husband seated at the kids table enjoying a “meal” prepared by the kids. I am a huge fan of imaginative play and now….so is my formally skeptical husband. 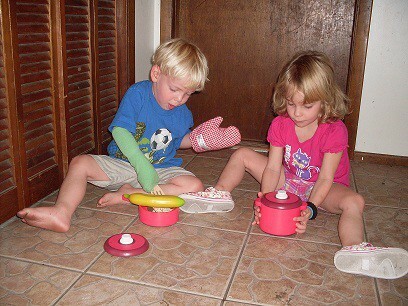 It is so much fun to watch our kids’ role play and get so much use out of their play food sets and kitchen accessories. Pretend Play Kitchens is a wonderland for blossoming young chefs. The selection of high quality play kitchens is amazing and the prices are very affordable. I admit that I still dream of buying our kids a “real” play kitchen. I really love the KidKraft Deluxe Let’s Cook Kitchen because it is made of sturdy wood and has gender neutral colors that would make my husband happy for “his boys.” For your little princess the KidKraft Pink Retro Kitchen is dreamy…my daughter has been sitting here gazing longingly at it as I write this review. 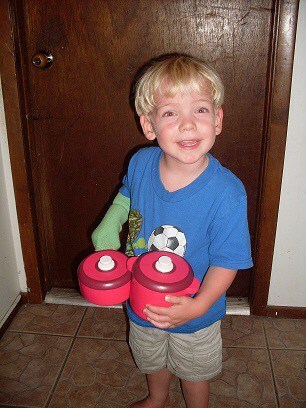 It is amazing how a few simply kitchen accessories can provide hours of pretend play for my children. The Melissa and Doug Play Kitchen Accessory Set is fantastic. This 8-piece wooden play kitchen accessory set includes a saucepan and pot with lid, frying pan, spoon, slotted spatula and an oven mitt. 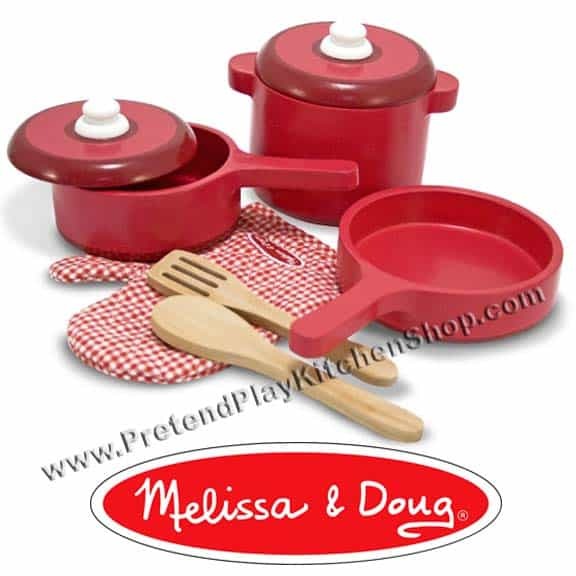 I am a big fan of Melissa and Doug’s quality and this kitchen set will last for my children and most likely could be passed down again and again. This wood kitchen set is very well made and my son immediately decided he would start frying a banana for my dinner. Over an hour later, I had to call them away from their Melissa and Doug play kitchen accessory set to eat their real dinner. Do you remember sitting down before the holidays as a kid and dreaming over the toys in the catalogs that would arrive in the mail? I remember waiting for it to arrive each year so I could imagine what would be under our Christmas tree. That is the only way I can describe how giddy and excited my children got when I sat down with them to look at all the play kitchen goods at Pretend Play Kitchens. You should have seen the “oh’s and ah’s” that this page got when they saw all the pretend play food. Pretend Play Kitchens is a “must” stop on your shopping guide for gift ideas this year. If you sign up for the Pretend Play Kitchens Newsletter you will receive an instant $5.00 off coupon code. Best of all is the free shipping on ALL ORDERS so you can start shopping and saving now at Pretend Play Kitchens. I love KidKraft Red Vintage Kitchen. Signed up for the email newsletter from Pretend Play Kitchens.